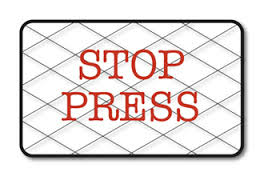 Other sources of information - official parliamentary publications, etc. 20/10/2017 Now the dark nights are on the increase my attention will return to indoor activities including the more frequent updating of this website. 29/07/2017 Esprit and Jonah leave Hillview for pastures new. A sad farwell. 16/04/2017 Updated pictures of Cadenza, Mary, Jonah, Trish, Jennie, etc. on their personal profiles. 21/03/2017 Today, I have added a section to the Book on Llama Nutrition and Feeding. 21/03/2017 Today, I have added a new section ' Book'. 01/03/2017 Today, I added an events calendar which I will also use for my own record of various events, activities and notes. I have made public some of the wider events. Don't forget that there are daily posting of images and articles on the Facebook site and occassional Tweets- see below. 01/03/2017 Today, I added an article on Llamas on the World Wide Web - a review of the 5K plus items on the internet. 25/02/2017 Today, I have added a new Guide to researching information on llamas. 24/02/2017 Today, I have updated the bibliography of academic publications on llamas. This now amounts to over 1.5K items. Over the next few days I plan to update the select subject bibliographies on such topics as breeding, injuries, etc. Entries here include abstracts for many of the items plus links to URL's to full text versions, PDFs, etc. Ideas for future topics welcomed. 23/02/2017 Several new websites and images added to the Virtual library. 15/02/2017 Today, I added to the virtual library or digitized publications on llamas and llama related topics. 10/02/2017 Today, I have added an Events section providing a diary of llama and llama related events in the UK and beyond. Anyone wishing to add entries please let me know. 26/01/2017 Today, I started a daily listing of interesting images and interesting articles on the Hillview Llamas Facebook. 25/01/2017 If you are interested in being granted access to search my Endnote online database of approx. 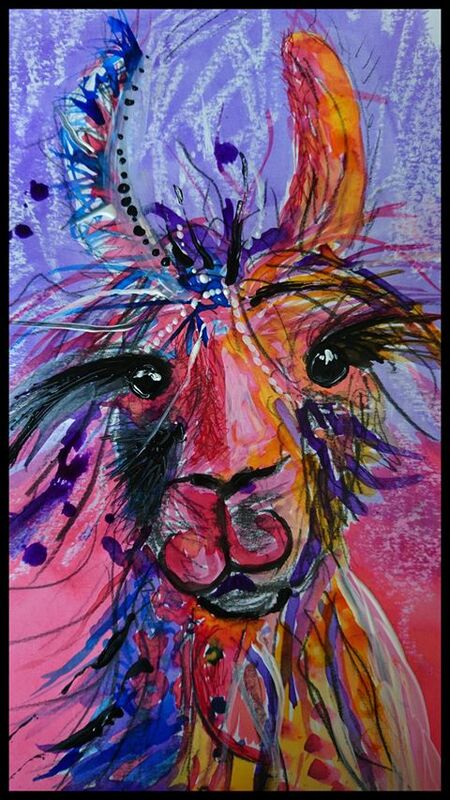 500 books, articles and theses on llamas and llama related topics please contact me privately. 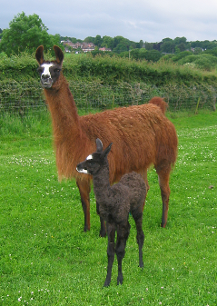 24/01/2017 The Hillview Llamas Facebook account now has daily articles of interest and images of interest posted on it. For pre 2017 items see archive below. 19.12.2016 - Winter truly with us now and the land outside the new shelter getting churned up more than I anticipated. Concern that several are getting a little too fat but hoping this is just nature at work preparing for the traditionally poorer herbage in the New Year. 16.12.2016 - Articles on Llamas Weird and Wonderful: Llamas and the World Wide Web now complete. If you would like a copy please get in touch. 12.6.2016 Good news, Chloe has given birth to a beautiful black girl Clare. 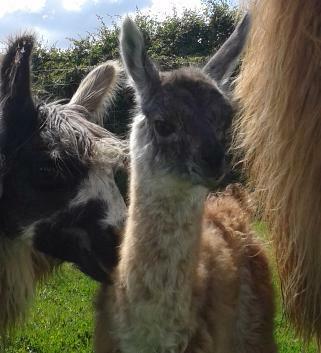 June- Samantha who is no longer at Hillview Llamas had a beautiful boy 'Noah' at her new home. Both doing well. 7.6.2016 Very sad news today to say that Issie, who is no longer at Hillview, died this morning leaving a week old male cria by Harley. Not sure how old she was but she had borne 5 beautiful babies successfully in her time here. She was quite a character and the matriarch who put all other llamas in their place when needed. She had an attractive face and was typical of British llamas 40 years ago. Two weeks ago yesterday, last year’s 7 cria entered training college. I am pleased and proud to report that this weekend they all graduated – two first, three seconds and two thirds. The first week’s classes were all about getting used to contact, last week taking a halter nicely and being groomed, this weekend, walking round the block on a lead rope. The final exam comprises ready acceptance of being held, haltered, leaving their paddock and classmates and walking nicely down the lane and not panicking about traffic, other animals and humanoids, a brush off down to the top of the legs to finish. They must achieve a minimum score in all parts. They attended class every day bar one (last Thursday) for a couple of hours, with private tuition for at least 10 minutes each within that time. One day they also attended evening class to make up for the lost Thursday. Each day there was a top and bottom of the class award. Surprisingly, this changed over time. Rupert was way out in front for the whole of the first week and into the second. Lottie and Sid, however, moved from near bottom of the class to win firsts by the end of the course. Jamie was placed in detention several times, nearly got suspended the first week for repeatedly going up on his hind legs, but came through at the end to secure a sound second. Kevin and Anya, were the two thirds, good at everything but taking a lead. They are going to have to return to class and if they improve will be upgraded. By and large it’s been fun and certainly rewarding.